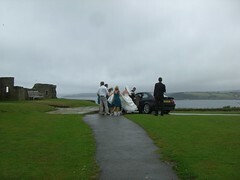 At Pendennis castle, a wedding party finished their breakfast then photographic sessions in time for the bride to be whisked away by the whirling winds of passion and tears of happiness mixed with the rain. Beautiful. A groom tackling a kilt would have added a cherry to my experiential cake. This scribble was published on Friday, July 17th, 2009. You can follow any banter on this scribble with the RSS 2.0 feed. You can share your inspired musings after typing the anti spam word near the bottom of the page. But no Pinging because its too naughty. Groom tackling a kilt? Now that would have been hilarious!